More excellent video tutorials from the screen of Daryl Gregoire of Revit Rocks! and CADclips. 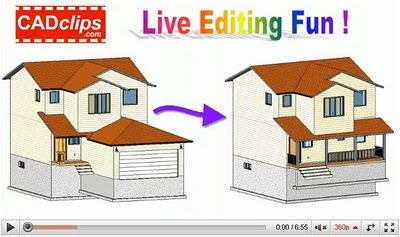 13 CADclip tutorials that demonstrate live editing to convert the House with the Garage to the House with the Front Porch as illustrated left. First we do all the modeling and then we go through and cleanup all the Views and Sheets.